About two and a half years ago, I bought a Logitech Wireless Anywhere Mouse MX. Logitech makes some of the very best peripheral devices for computers and tablets, and this mouse and I have been through a lot together. I’ve used it heavily at home, in school, and on the road for years. The cursor tracks well on almost any surface imaginable, the wireless connection is robust enough to allow for control from across the room, the buttons and scrollwheel all respond crisply, and the mouse lasts for months on a single set of AAs. I contacted Logitech support, and after a few quick troubleshooting steps, the technician decided that there must be a hardware fault inside of the mouse. Because my 2.5-year-old purchase still fell under Logitech’s three-year warranty, they offered to ship me a brand-new unit for free. Let’s get this straight: I had already gotten well more than $49 of use out of my old traveling companion over the years, but Logitech was willing to send me a brand-new one for free because it hadn’t quite made it to its third birthday. Actually, I’m reminded of a similar incident which happened about a year ago. The USB receiver for my mouse came unglued over time and broke apart. (This isn’t terribly surprising– years of sitting plugged in in an exposed position and getting jostled about in various cases and laptop bags would take its toll on anything.) It’s possible to buy spare receivers, but I just let Logitech know that mine had broken under normal use, and they sent me another one for free. So in addition to making incredibly solid, well-performing products, Logitech is practically the LL Bean of the electronics world: if something isn’t quite right, they make it right. And that’s why I’m their customer. I think it’s fair to say that many, if not most, K-12 teachers are familiar with Minecraft. It’s an open “sandbox” world where players can interact with their blocky environment and build whatever wonderful creations they can think up. For the past few years, it’s been a wildly popular game with children and adults alike, and the Internet abounds with stories of teachers either incorporating Minecraft into the classroom or else bemoaning that their students use school computers and laptops to surreptitiously play the game when they should be working. 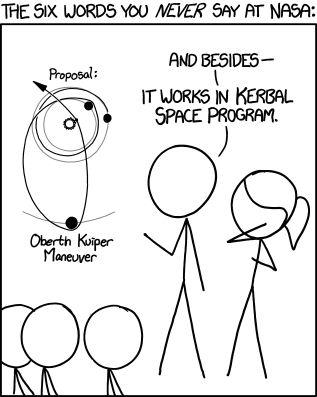 Kerbal Space Program is a similar game in the sense that it’s a “sandbox”. You start at a space center (approximating Cape Canaveral) on a fictional planet in a fictional solar system similar to our own, complete with many planets, moons, and even gas giants. Your home planet, Kerbin, is populated by a race of little green aliens called Kerbals. At your space center, you can build rocket ships and space planes out of a giant variety of parts, snapping the pieces together like legos. For example, a basic rocket ship might have a command capsule (i.e., a cockpit) at the top, a fuel tank, a rocket engine, and some landing struts. More complex spaceships might have literally thousands of individual parts. In addition, the game requires strict resource management. Rocket engines need both fuel and oxygen to burn, while atmospheric jet engines only need fuel. If you rely on any electricity-based parts like floodlights, you will also need to install batteries and a power source like solar panels. The little jets which help you adjust your ship’s rotation in space require tanks of monopropellant. The only resources you aren’t required to handle are those related to life support like food and breathable oxygen—but maybe that’s a blessing, because you don’t want to watch your little green spaceman asphyxiate or starve! Due to its realistic modeling of Newtonian physics, Kerbal Space Program can plausibly be used as a classroom tool to demonstrate concepts such as orbital mechanics, weight vs. mass, specific impulse, and the importance of the thrust-to-weight ratio in overcoming both gravity and inertia. But where do you begin? There seemed to be some interest in how I used KSP in a high school classroom, so I figured I would finally get around to writing this up. I am cursing my laziness however, because I didn’t know that twitch deleted recorded streams. 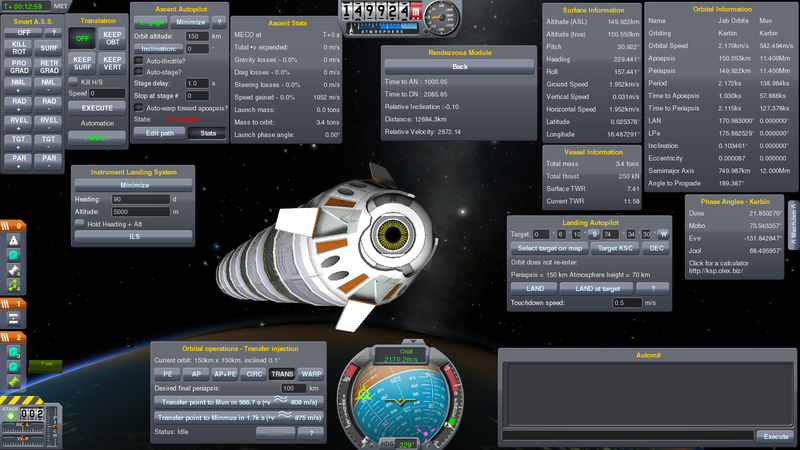 Therefore, my plan of cutting together a couple videos of my kids actually using ksp was ruined. Oh well, I’ll just have to do it again next year! This project was less about using KSP to teach a physics concept (although they did learn a lot), but more a recreation of the various mission control styles of play that have been posted on this sub before. Some background, all the students involved (19 in the class, 10 participated) were in my AP Physics B class, and we did this after the AP test. Unfortunately, the original project was severely scaled back as Prom, finals, senior week, Six Flags fieldtrip and other AP tests all filled up the limited time we had available. In addition, I had to miss several days to go to various workshops because of new science standards, so several of the worksheets provided we designed to be done while I was gone. This was the original plan however we wound up scrapping most of it. I wound up building the students their rocket (two of the actually) and we never used the corporation idea. Pretty much we had 14 days, and the schedule went something like this. Day 14: Would have been landing day and attempt a return as quickly as possible, but 0.20 came out the night before, and with my steam install in broke the rocket we were using. The students never actually landed or returned. The kids seemed to get a lot out of it, even if there was a lot of frustration. I think 4 of them went out and bought the game afterwards and a couple have been in touch sharing what they have accomplished or asking questions (most of them graduated right after this). The success of the set-up has convinced my tech department to try and install KSP on a server build, so this year I am going to come up with lessons for angular momentum and kepler’s laws to use in the units themselves. I really wish I had saved the video streamed from the flight computer, there were some pretty hilarious failed launches, but after each one they improved. Students watched the youtube videos as a class (to find the videos just look up the titles). The back is pictures and data for the 3 stage rocket they took to the mun. It’s not pretty, but I tried giving them as generous of a fuel budget as possible. At one point they found out it goes interplanetary pretty easy. For those of you who want a crappy lesson plan, I rarely write them so it is pretty bad, but I used this for a requirement for a grad school class. So it’s early, and I am likely rambling a bit, so if you have any questions feel free to ask. I promise that when I do this again next year I will take more pictures and video! What do you think? Computer simulations of various kinds have had a place in the physics classroom for years. Is there room for a more whimsical, fleshed-out “edutainment” product like Kerbal Space Program in your curriculum?